One of our chamber members and local business leaders has recently taken another step into the international business arena. 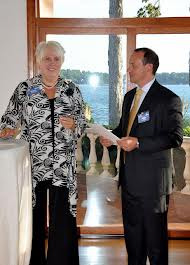 Ralph Daetwyler, President of Max Daetwyler Corporation in Huntersville, was recently honored when he was named the Honorary Consul to Estonia for North Carolina. In this distinguished role, Ralph will assist Estonians in North Carolina as well as abroad in business and investment related recommendations and general informative work on topics such as society, education and culture in Estonia. While there I had the opportunity to chat with Marina Kaljurand, Ambassador of Estonia, Sten Schwede, consul general of Estonia and Heinz Roth, honorary consul of Switzerland, as well as Huntersville Mayor Jill Swain and board members Sarah McAulay and Melinda Bales. That evening reminded me about an experience I had in 1991 with the Estonia Junior Chamber that I shared with the Ambassador. That year, I served as National Vice President of the US Junior Chamber and attended the Junior Chamber International (JCI) World Congress in Helsinki, Finland. At that event, Junior Chamber Estonia was recognized as a fully affiliated national organization in JCI. I will never forget watching Erlend Tammenurm from Rapla, Estonia as he took his place on stage in front of more than 4,000 International delegates waving his country’s flag with tears in his eyes. At first I was taken back that this professional and reserved man would openly show such emotion on the occasion. Then I was reminded it had only been a few years since Estonia was a country of the Soviet Union and public assemblies and the right to freely associate would have not just been discouraged – many would have been imprisoned. As President of the United States Junior Chamber (Jaycees) and later as an International officer, I had the chance to visit with delegations from throughout the world. However, the single most powerful occasion was seeing the impact that moment had on Erlend. This month, on November 6th, Americans will have the chance to exercise a right we often take for granted – the right to vote for our elected leadership. As Americans, we have the freedom to choose who will represent us in Washington, Raleigh, and right here at home in Mecklenburg County. We should not forget that throughout this world many people do not have that right – their voice cannot be heard and the will of the majority does not prevail. Each of us has that right because generations of Americans have paid dearly though their sacrifice – young men and women who stand watch and in some cases pay with their lives, so that we may vote on Election Day. 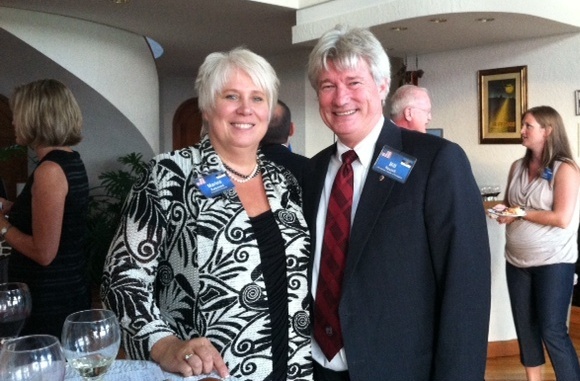 It was a privilege meeting the Ambassador of Estonia and honoring Ralph in his new role. I regret though that one detail, small as it may have been, was omitted when I shared with Ambassador Kaljurand my story. I neglected to tell her as I watched Erlend Tammenurm wave his country’s flag – his smile as big as the stage he was on – with the tears which streamed down his cheeks … maybe it was the moment, I’ll never know… but I cried too. This organization has been filled by generations of young people, each with the challenges of their day. It was through commitment and courage that we as an organization have stood the test of time. Challenges have always faced us…they did yesterday and they will tomorrow. Like the past generations of Jaycees, we embrace those opportunities…and not one Jaycee member out there tonight … would shrink from that responsibility. We will meet them head on. Together! Like Plato once said, “The beginning is the most important part of any work.” Tonight we embark on a new beginning… a new Jaycee year. There is a new world facing us out there. It is a world filled with discovery and promise. It is a world that we can use to unlock the potential of America’s young people. Our future is unstructured as a dream. The only limitations we have are those we impose upon ourselves. Someone once said that the world changes at such a pace, that each day writes a fresh page of history before yesterday’s ink has even dried. Today, the task at hand is simple – the Junior Chamber of Commerce must lead again. As it always has – as only we can. It is time to write history. Not content to merely be a part of it. June 30, 1971 an amendment to the constitution was ratified giving 18 year olds a right to vote. Young people making decisions about the future direction of their nation. This is the 21st anniversary of that amendment. Throughout America, people are disillusioned about their government leaders. They are desperate for leadership. However, our country has always survived and leaders have always emerged. It is time for that leadership to emerge again… It is time America felt the power of her young people. It falls to our young people to lead this nation…to restore her. This year our Jaycee Chapters will register voters, sponsor candidate debates, and get the issues out to the communities through a program called “Wake Up America!” We will again be young people of action. Over the last couple of decades there has been a decline of family values. Times are different from when you and I were in grade school. Teachers have been replaced by TV’s and VCR’s. Kids learn more from Doogie Howser and Bart Simpson than they do from mom and dad. This year the United States Junior Chamber will answer the needs of our single parents and young families through a program called Junior Jaycees. Getting our kids, young kids involved… instilling in them the values we cherish as Jaycees. Over the past few years we have placed more emphasis on short term goals and rewarded people for short term success. People are recognized for what they do this year with no consequences to what becomes of their chapter next year. Our Blue Chip program is the key to chapter success. Long term goals and the commitment to carry them out. We must not sell ourselves out to short term success. We must stop living for today with no plans for tomorrow. Most of all – we cannot and will not settle for mediocrity. We must build a strong Junior Chamber chapter – one that is better today than it was yesterday. Continuing to fulfill our mission of providing leadership skills to America’s young people. We are a leadership training organization and it’s time we got down to the business at hand. Teaching young people the skills they will need to be more productive and competitive in the business world. Give them the chance to nurture networking skills, meeting other young people, fostering strong relationships, building bridges to the future. The number one reason people leave our organization prematurely is because we do not deliver on our promise. People leave feeling they have not received what they were looking for and they walk away…empty handed. We must train our chapters to deliver on those promises…today. It is time the United States Junior Chamber came out of its isolation and joined the Junior Chamber organizations of the world. Junior Chamber International is growing, prospering, and delivering on its promise of leadership training through community service. It uses the principles of those young men from St. Louis, Mo. whose dream it was to give young people business and community leadership opportunities. I am asking each of you, if your chapter is not already, consider twinning up with another Jaycee Chapter in another country. We can learn so much from each other as we move to an age of Global Citizenship. United States Jaycees, I believe in you with all my heart and all my soul. Let us prove this year, we are the premier young people’s organization in America…and let us not fail in that task. Thank you.